A Red Ear Slider is not by any means a simple or inexpensive responsibility. There are several essential requirements that should be carefully planned when building or setting up a habitat, all of which play a role in establishing a healthy turtle. Since wild RES are adapted to certain environmental conditions, it is beneficial to have your setup reproduce some of those conditions. Ideally, you will have your set up ready and functioning before you bring your RES home. For an idea of basic costs, refer to the What are the Costs of Necessary Items? page. Please go the water quality and water filtration sections for more complete information. Tank size is the first critical issue you will have to deal with. A guideline to determine this size used by many keepers, as a minimum, is 10 gallons of tank per each inch of shell length (refer to SCL for correct shell measurement). Therefore, a single adult RES will require anywhere between a 90 to a 120 gallon tank. Water levels should be as high as possible, but not enough for escape. There are more details about appropriate tanks in their own respective section. Click here to read now. Water filtration and quality are also major aspects of a well-maintained environment. Since captive RES eat, sleep and produce waste in the limited amount of water they are in, it is critical to have well-cycled and filtered water. Clean water greatly reduces the instances of infection, algae and fungal growth.. The presence and build-up of harmful bacteria and waste should be monitored regularly. Water filter types, media options and more water quality aspects are explained in their respective sections. Please go the lighting and basking section for more complete information. 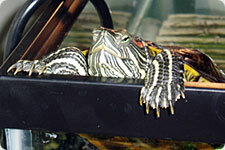 A correct environment also allows for your turtle to thermoregulate or regulate body temperature. Hatchlings should have a water temperature of 78F-80F, while adult RES can do fine in a temperature of 75F-78F. A basking area should be available that is roughly 10F warmer than the water. With these varying temperatures, sliders can thermoregulate to their POTZ (preferred optimal temperature zone). When sliders are out of this zone, whether it is too cold or warm, they may not behave normally and will become increasingly susceptible to illness and disease. Temperatures that are too cool are often called a “death zone” since they are not cold enough for actual hibernation but cold enough to inhibit their metabolism. Hibernation is considered unnecessary and dangerous for captive RES. The required basking area allows for your turtle to dry off and warm up. A heat lamp positioned above the tank will be necessary to raise temperatures an additional 10F. This is also a good spot to add special UVB lighting and direct it over the basking area. UVB rays allow your turtle to produce vitamin D3 which enables the metabolization of dietary calcium. Unobstructed sunlight is the best source of UVB and warmth. If you intend to keep a slider in an outdoor habitat, it will not be necessary to provide artificial UV rays if there is ample sunlight reaching the basking area.